Responsive design is often framed as an implementation challenge; We focus upon the technical issues of making our designs squeeze onto different devices. 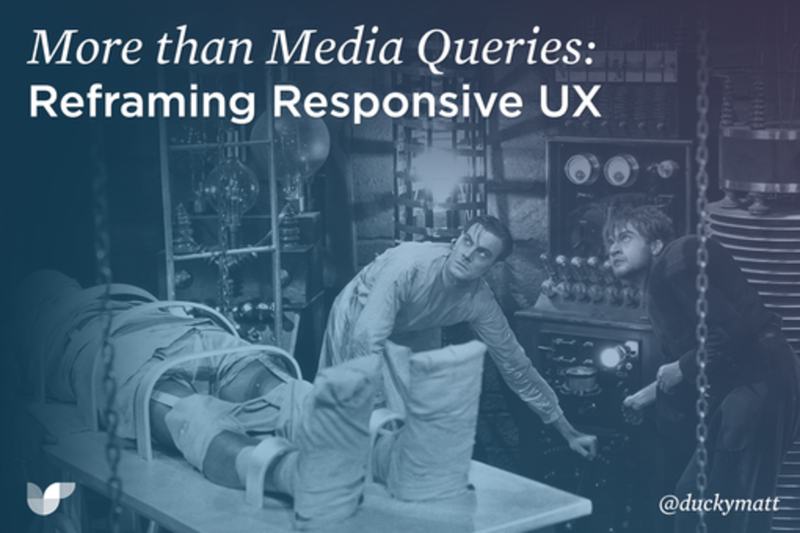 Instead, this session will cover responsive design from a user experience perspective; looking beyond media queries at the challenges (and how to overcome them) of mobile content strategies, designing for performance, and being more future friendly with progressive enhancement! Using all of these techniques, we can create better responsive designs, that are truly exceptional, for all users, on whatever device they're using. Matt is a designer, tea lover and part-time Wookie. During the day he is Production Director at Cyber-Duck (cyber-duck.co.uk), a full service digital agency based in London and Elstree. At Cyber-Duck, Matt oversees all design work from the early research and planning stages, to sketching and designing interfaces, right through to helping deliver HTML/CSS code. Matt regularly speaks at leading industry events and writes for notable publications including Design Week and Web Designer Magazine. He has also been published Smashing Magazine's "Responsive Web Design, Volume 2" book​​. Matt has also featured on our TV screens; first he produced an interactive comic for The Gadget Show where he had Iain M Banks roaring with laughter; then he featured on BBC Watchdog by helping to shine a light on websites that trick and confuse users into paying more than they bargained for. Matt also loves to get involved in teaching the next generation of designers by lecturing and mentoring students at UEL as well as getting involved in initiatives like Young Rewired State.